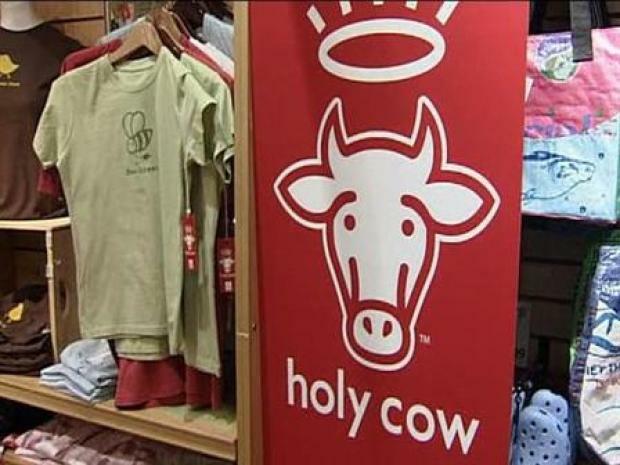 Track your organic tee from start to finish with Holy Cow Co.
Holy Cow! That's an eco-friendly T-shirt! What are you wearing right now? Is it a T-shirt? Well, the average conventionally grown cotton T-shirt requires 1/3 lb. of pesticides to produce! Make you want to change? When shopping for your next organically grown tee, make sure it's truly green. According to Katherine Melenovski, Marketing/Community Relations Specialist Whole Foods Gold Coast, just because it says it's organic, doesn't mean it's true, "It may say its organic T-shirt but the practices of its production and how it came to be you might not agree with." Melenovski says that's why shopping at Whole Foods is easy for the green consumer, "We like to think of ourselves at Whole Foods as a filter. We look at different products out there and filter out to find the most natural, organic products for our customer." The latest company to stay afloat in the Whole Foods filter process is a young one out of Minneapolis. A company that began small with a big mission according to it's founder, Justin Barrett, "Holy Cow is the best clothing on earth and that's our mission. Healthier for you and the planet." It's a T-Shirt That's Truly Green - Holy Cow! Holy Cow! That's the expression you're supposed to have when you realize just how green this company's T-shirts and sweatshirts are. Barrett, a native of Minneapolis, MN, grew up around apparel in his family's silk screening business and learned what goes into the making of clothing, "We want people to think about their clothing. Where did it come from, how did it get here, who's involved with production?" Questions you likely DID NOT ask yourself last time you slipped into your favorite sweatshirt or tee. With Holy Cow, you can more than ask the questions, you can get the answers by typing the code attached to your garment into the website at HolyCowCo.com --and you will be able to trace it from the fields in India all the way to the finished product. For the founder of Holy Cow, the story behind the garment is just as important as the finished product," I care about the story of individual farmers in India--developing cancer...We source from GOTS (Global Organic Textile Standard) farms in India, the cotton is grown in Central India, then shipped to California to be manufactured, and finished in the Midwest. Barrett and other members of Holy Cow plan to leave on Earth Day this year for India to meet the farmers and shoot a documentary on the making of their clothing.